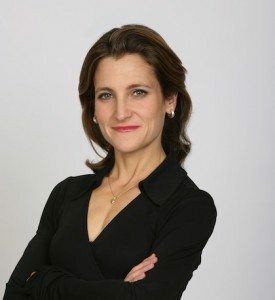 Chrystia Freeland, winner of the 2013 National Business Book Award for her book Plutocrats: The Rise of the New Global Super-Rich and the Fall of Everyone Else (Doubleday Canada), has confirmed her foray into federal politics. The race to replace MP Bob Rae in the Toronto Centre riding is gaining momentum as the Thomson Reuters editor and managing director has confirmed she will be seeking the Liberal party nomination. The seat became vacant on July 1, when Rae, the former Ontario premier and interim Liberal leader, resigned his seat. Liberal Leader Justin Trudeau, who has organized his platform around the revival of the Canadian middle class, has quoted extensively from Freeland’s book, which looks at economic disparity between a small number of immensely wealthy people and the rest of society.